Chronicle of the creation of the Red programming language. Created by Nenad Rakocevic "DocKimbel". 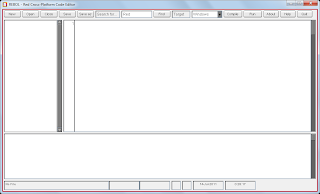 Inspired by REBOL Programming language and bootstraping created with REBOL. I will publish news for Cheyenne, REBOL and mobile phones. ARM is now supported on Red/System. REBOL, the programming language created by Carl Sassenrath, has inspired another programming language : World ! Created by John Niclasen (alias Geomol), an active contributor to REBOL (NicomDB, NicomDoc, RebXML, ...). There's also an Altme group #world to discuss about this new language. Jocko (a member of REBOL's french community) has made a demo for Red/System of Google TTS. 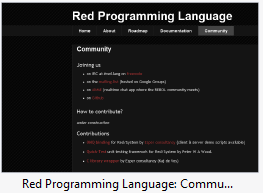 Red/System has reached v0.2.1 stage : article on Red's language site. Red/System has now a BNF grammar (written by Rudolf W. Meijer). Red/System has been port to MacOSX. 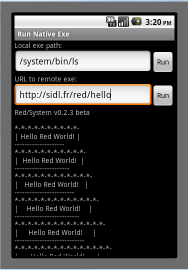 New Red/System editor in REBOL ! 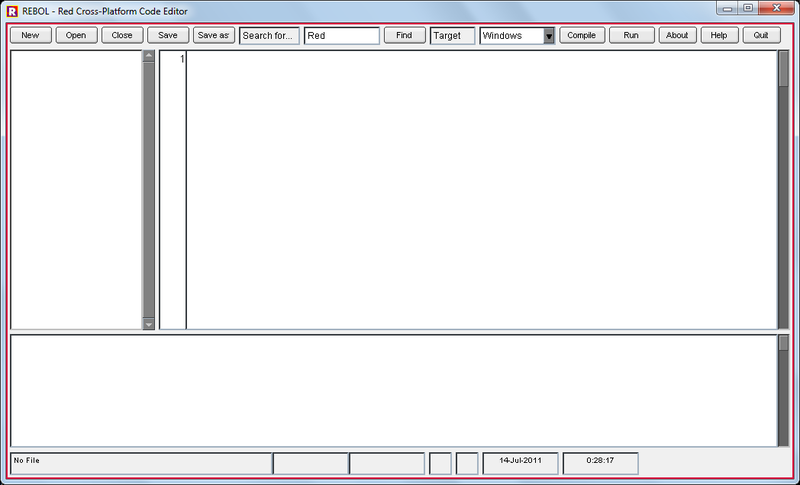 Francois has made a REBOL editor for Red/System ! You can edit Red/System source, compile it (for Windows, Linux, MacOSX) and run it ! Maxim has working on the first module for Cheyenne : web-api. The source are available here. The aim of this module is to offer Webservices like functions. 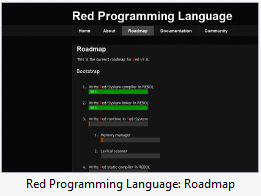 Since Red/System has reached beta level, Nenad has working on the improvment of red-lang.org site. And he did a great job ! We have no 2 new sections : Roadmap and Community (formely Contribution section). Roadmap is really transparent. No surprise. The priority of the code backends goes to ARM support (Netduino, Android) and a new one : AVR. It seems that Nenad is focusing on small electronic system. The community section presents all communication channel and include now AltME (of course we often say that AltME is darknet, but AltME is so small, so quick, so Rebol, hope that a RedME in the future will happen ;) ). Nenad is doing a very very great job on Red programming language creation and communication with the community ! (c) 2011, RedChronicle. Thème Picture Window. Fourni par Blogger.